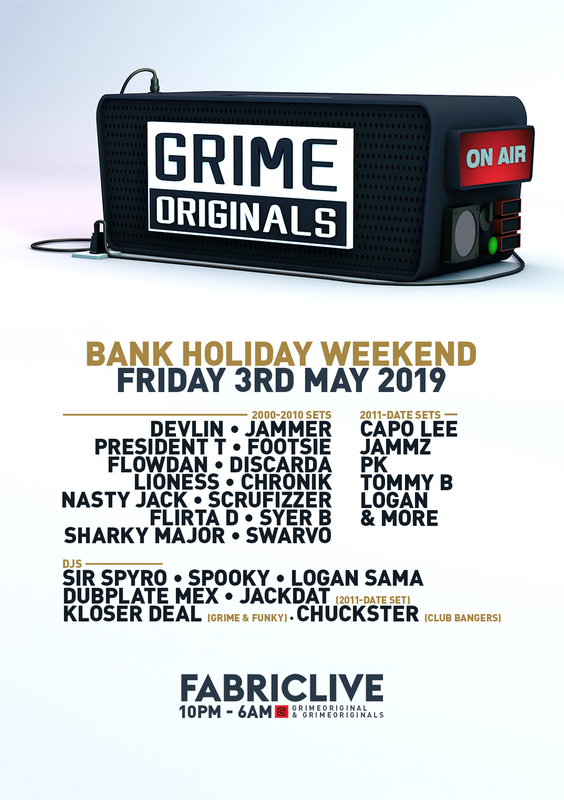 For the first May Bank Holiday weekend, Grime Originals take over FABRICLIVE to cover the genre’s full history. Repping the 2000s are a string of grime’s most essential voices, with Devlin leading the proceedings. The East London artist prepares to play his first set with us in 8 years, bringing the lyrical mastery that’s defined his work on Island, and his own Devlin Music label. Joining him in Room One is one of the leading figures of the Boy Better Know camp, Jammer. Star Work artist President T also lands, flanked by Newham OGs Footsie and Flowdan. 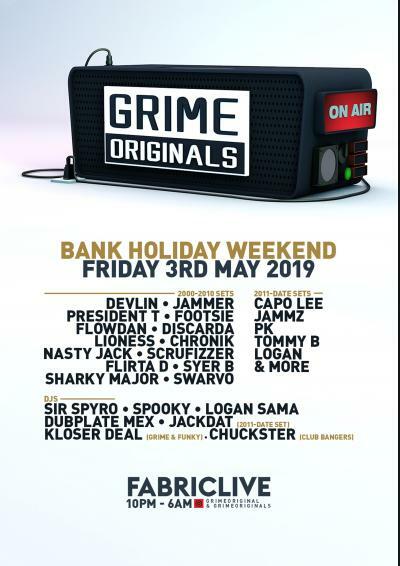 Plus, Discarda, Lioness, Chronik, Nasty Jack, Scrufizzer, Flirta D, Syer B, Sharky Major and Swarvo all line up to bring the heat. A clutch of key MCs and DJs join to bring us into the current day. Taking over the mic are Capo Lee, Jammz, PK, Tommy B, Logan, and more to be revealed soon. Behind the decks, we welcome Rinse FM mainstay Sir Spyro alongside the urban sounds of Spooky, Logan Sama and Dubplate Mex. Finally we’ve pulled in a series of specially curated sets for the night: Jackdat plays tracks from 2011 through to today, Kloser Deal heads on a grime & funky tip, while Chuckster packs in his biggest club bangers for the occasion. In Room Two, it’s a different vibe as Funky Originals drop in. One of the sound’s true pioneers, UK artist Marcus Nasty makes a return. He’s joined by Pioneer, Supa D, AB and MA1 behind the decks, while Bushkin, Dogtanian, Tippa, Mic Man Frost and Perch take on hosting. Room Three hands the reins over to one of London’s leading underground radio outlets, Reprezent. Full line-up details are yet to be revealed – keep an eye out for more info soon.